Season ticket holder Jeff Goulding provides a response to the skeptics questioning the planned protest on Saturday at Anfield. Imagine for a moment you are transported a century into the future. You are a historian studying football culture from a bygone age and pouring over antique blogs and pages of social media messages. You come across a fascinating story from the history of Liverpool Football Club. It’s a story of resistance and protest and of distant owners with scant regard for the concerns of supporters. The club had been taken over by American investors who had “come to win” and who spoke of how they understood the dreams and aspirations of its devoted followers. At first they were welcomed with open-arms. However, the lessons of history had taught these supporters to judge others by their actions, not their words. Initial attempts to engage with these owners were positive, but soon went awry. It would eventually become clear that money and profit was their overriding concern. The supporters began to protest, but they never realised the hurdles and barriers they would face before ultimately securing victory. They would face fierce criticism, derision and insults, not from the owners, or the media, but from some of their own. A barrage of ridicule came their way. They were accused of not doing enough, then of going too far. They were called fools for thinking they could take on such a powerful foe, or condemned for damaging the very thing they were fighting to protect. Imagine your confusion as you follow this story. Eventually though you would rejoice in the ultimate victory of the supporters. You would smile as you learn that the villains of the piece, Tom Hicks and George Gillett were eventually driven from the club, cursing the band of “internet terrorists” who defeated them as they left. What a story this is, a modern day David and Goliath. It is a victory for the common supporter over big business. Surely these people became heroes, revered by Liverpool supporters everywhere. Not only did they fight off the clubs owners, who were armed with expensive lawyers and deep pockets, but they also proved the doubters in their own ranks completely wrong. Victory had been possible all along. They had set a benchmark for supporter campaigns. They’d created a model for all supporters looking to have a say in the clubs they love. Surely nobody would ever doubt them again. Nor would they question the validity of protest as means of winning concessions from the owners. Now imagine how incredulous you’d be to find out that before the decade was out, history would repeat itself. Those same supporters would again find themselves having to stand up for their right not to be exploited for the profit of others. Even more incredibly they would once again face fierce criticism from within their own ranks. Sadly this is exactly the position we find ourselves in today. I along with many others have written about our support for protests against further rises in ticket price rises. In doing so we have either created a rip in the space time continuum, allowing people from the past to populate the comments section underneath our articles; or these are actually people from the present day who are spectacularly unable to learn the lessons of recent history. 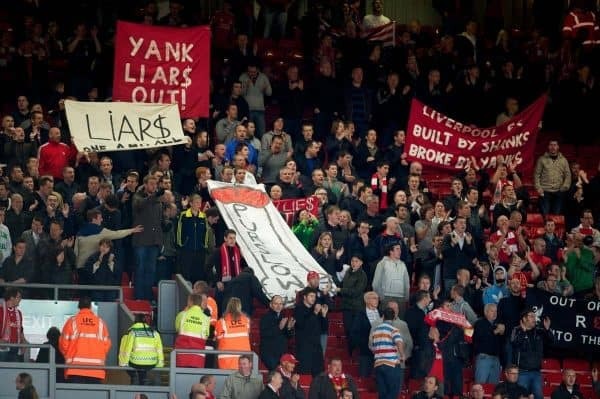 Liverpool supporters have never given up when told our cause is hopeless. This character trait is shared by the city as a whole. It’s a source of great pride to me, that when people become supporters of the Reds they understand that’s part of our culture. We are relentless when we feel others are abusing their power, or when there is a sense of deep injustice. So it frustrates and irritates when others use social media to mock supporters like me, who are fighting for affordable ticketing for all. Perhaps I’m being unreasonable. How can I expect people to understand my position unless I engage them in debate and discussion? So here’s my attempt at answering the most common jibes aimed my way in the last couple of days. Do nothing, accept it and choose not to renew their ticket next season. If they choose this path they have effectively allowed the club to price them out of the game. Someone else buys the ticket they vacate and another supporter is forced to pay the new exorbitant fee. That’s’ not an option I’m prepared to consider. I’d prefer to put up a fight. The second option is to send a strong statement to the club that they object. It’s the equivalent of a shot across the bows if you will. It sends a message to FSG that we are serious. They have a chance to pull back from their plans and reconsider. If they do the protest stops. If they don’t it could escalate and take on other forms of boycott. Don’t you believe it! Even a half empty stadium, with almost fifteen minutes to go, would make the news. Sponsors would be concerned and questions would be asked. It would be a powerful message that more engagement is needed. FSG are relentlessly monetising the LFC brand all over the world. They don’t want it to be associated with discontent and protest. While its fine that they are maximising the club’s revenue, all I would ask is that they spend some of that on reducing ticket prices, allowing more people a chance of getting to a game. Steady. It may come to this, but please read the comments above and consider the difficulty we are having convincing some fans to walk out for 13 minutes. In any campaign you have to start somewhere, gather like-minded people around you and grab as much attention as possible. Then you begin educating and recruiting more supporters and the message grows in power. This was exactly the way it went when a little group called ‘Spirit of Shankly’ held their first meeting in The Sandon. They encountered much of the same scepticism back then, but proved everyone wrong. Ultimately FSG are concerned with the bottom line. I get this. They are business men. However, we need to understand that developing a reputation for neglecting your supporters can’t help their cause. They are smart guys they will realise that. The walk out protest on Saturday will cost them nothing, but it will make them think. It will attract negative publicity for them. They won’t be foolish enough to believe it will go away if they ignore it either. What would be worse in my view would be for supporters groups to call a protest and for everyone to ignore it. 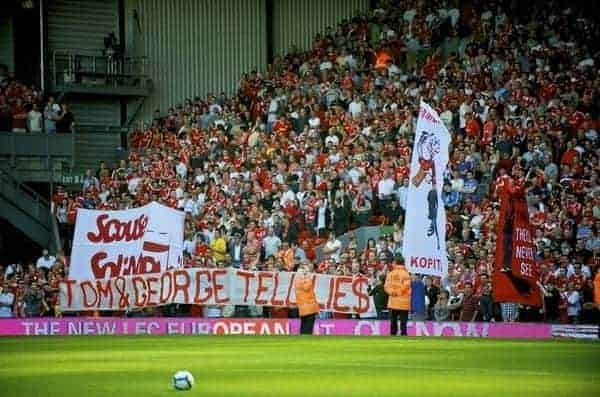 That would send a clear message to FSG that we are not bothered and they can do what they like. I can understand and even sympathise with this one. Liverpool was built on the fabled ‘Holy Trinity’ of Supporters, Players and Manager. This at times has been an unbreakable bond that has led to unparalleled success. To this I would say this; we have been there for the players and successive managers over countless games. We have roared them on to trophy after trophy. Now it’s time for them to be there for us. I am not asking them to walk out with us, but I do expect them to understand. After all they are paid very handsomely for their services while we scrimp and save to buy tickets to watch them live out our dreams. Klopp actually has a track record of being there for the Dortmund supporters in similar circumstances. I have no fear he will be any different tomorrow. I am sure I have missed out many other arguments, but I think I’ve captured the most common criticisms of the protest. Ultimately there are some who will never be convinced but, in the hope that there are a few open minded doubters out there, if I’ve convinced at least one or two to #walkouton77 I’ll be happy.